Daily Guide -- After six long years of silence on the real undercurrents in his ever-worsening stormy relationship with the former President, Jerry John Rawlings, President John Agyekum Kufuor has decided to tell the world why, where and how it all started. Speaking with Kwame Sefa Kayi, host of the Kokrokoo Morning Show on Peace FM, yesterday March 2nd , 2007 from his West Airport private residence, President Kufuor disclosed that he had had three secret meetings with the ex-president at various locations in the country, and that all the meetings were at the instance of Rawlings.He said it was when he took a firm stance and refused to be ‘kicked about’ by not attending such meetings that his predecessor took offence.The President’s revelation may put to rest the years of speculation in the media as to what actually caused the bad blood between Rawlings. President Kufuor who had been bad-mouthed by the main opposition political party, the National Democratic Congress (NDC), a number of times, said soon after the 2001 handing-over ceremony, Rawlings invited him to meet him at the house of one elder statesman in Tema, to which he obliged, even though it was not the best decision.“The elder statesman, in whose house we met in Tema is alive today,” he told Kwame Sefa Kayi. The second meeting, according to President Kufuor, took place in the house of another elder at the Airport Residential Area in Accra and once again he accepted to answer Rawlings’ call even though some New Patriotic Party (NPP) leaders were against the business of Jerry Rawlings calling the shot. And as a clue, the president hinted that the owner of house that hosted them in Accra had died not too long ago. “For the third time,” he went further, “the former president asked me to meet him in the house of a traditional ruler in Kumasi, and once again, the meeting took place,” he said. 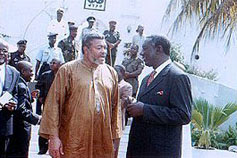 Even though he would not be drawn into the details of discussions at the three secret meetings, the President said he decided not to honour further any such meetings because they did not only disregard protocol but show affront to the presidency as well.His refusal to honour subsequent meetings, he explained, incurred the displeasure of Rawlings. Asked whether it was necessary to send an emissary to invite the man who had been cold towards him for the Golden Jubilee anniversary, he said he had every respect for the position of a former president because he too would be one soon and would like to be respected when his time was up. “I can’t close my eyes and pretend there is no former president in this country because whether we like it or not, he too once served this country,” he explained, noting that in spite of the differences in ideology between his party and the Convention People’s Party (CPP), no one could run away from the fact that Osagyefo Dr. Kwame Nkrumah was a great leader. President Kufuor pointed out that this was a Jubilee Year, and expressed his willingness for reconciliation in the national interest. On the celebrations, he said it was unfortunate that those criticizing it were talking as if government had stopped functioning in the various sectors, and disagreed that the $20million being spent was too much. “We like to compare ourselves with Malaysia because we attained independence with them almost the same time.I believe they might be spending billions of dollars in July this year for a similar celebration. Our neighbours in Cote d’Ivoire have a whole Presidential Village. Nkrumah put up Job 600, which could cost some $50million today,” he said. 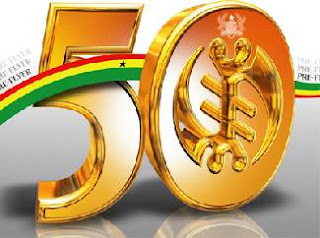 According to him, the celebration was necessary, not because poverty had been completely eradicated in the country, but largely because for 50 years, Ghana had remained one entity while many others had gone to war and were on the brink of disintegration. He admitted that being president was not that easy, but observed that his government had accomplished a lot in the past six years. President Kufuor catalogued the National Health Insurance Scheme, the West African Gas Pipeline, the Capitation Grant and the Millennium Challenge Account (MCA), boasting that no government had done quality roads in the country within such a short span of time. He, meanwhile, expressed confidence that those criticizing the celebrations were by far in the minority to those who supported it.